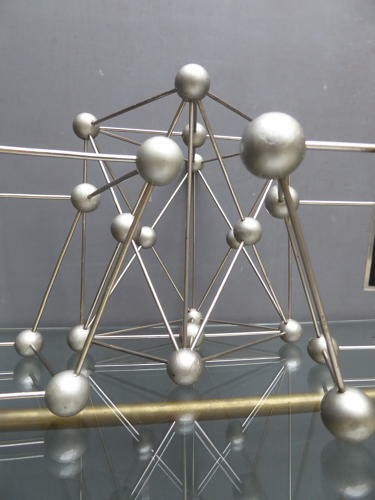 A fantastic, trio of vintage atomic laboratory molecule models. Three wonderful examples, the atoms in their original painted finish with adjoining chrome rods, all finished with their original alloy labels. The largest of the three models is labelled 'Ortorombicka F' & two the smaller 'Hexagonalna R' & 'Hexagonalna'. Interesting, tactile & very decorative! Price is for the three. Minimal wear commensurate with age, very good overall with some expected signs of age to the lables. Measurement above is for the larger model, smaller models are around 23cm x 14cm x 12cm.